On 27 April 2015 Telefonica published (link here) on their public policy blog a review of the Digital Fuel Monitor methodology. Telefonica’s critical review of the Digital Fuel Monitor methodology is based on a review (link here) conducted by a consulting firm called Solchaga Recio & Associates (SR). Telefonica's main concern was adressed at the approach of characterising mobile internet access competitiveness by using the Digital Fuel Monitor developed metric of price per incremental gigabyte. Note that in their investor presentations operators are often using the Telefonica-criticised price per incremental gigabyte metric as the main measure of market competitiveness. Let us cite here the CEO of the ETNO member Elisa Group (link here, slide 9). 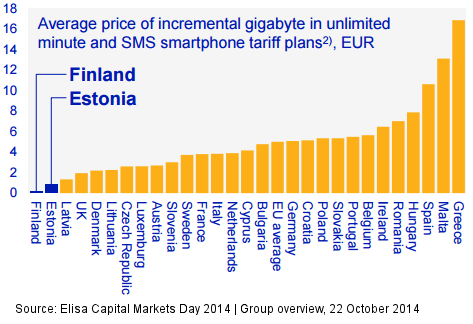 Clearly, the price per incremental gigabyte alone cannot fully and perfectly characterise mobile internet price competitiveness (that is why DFMonitor analyses consistently compelement it with 'base prices' and basket prices). However, it is our conviction that going forward the price per incremental gigabyte will become the central competitiveness metric and not only in the context of benchmarking the competitiveness of individual national mobile internet access markets but also in the context of the EU-wide policy debate on data roaming and net neutrality.